I was just messing about an experimenting when I came across this issue. 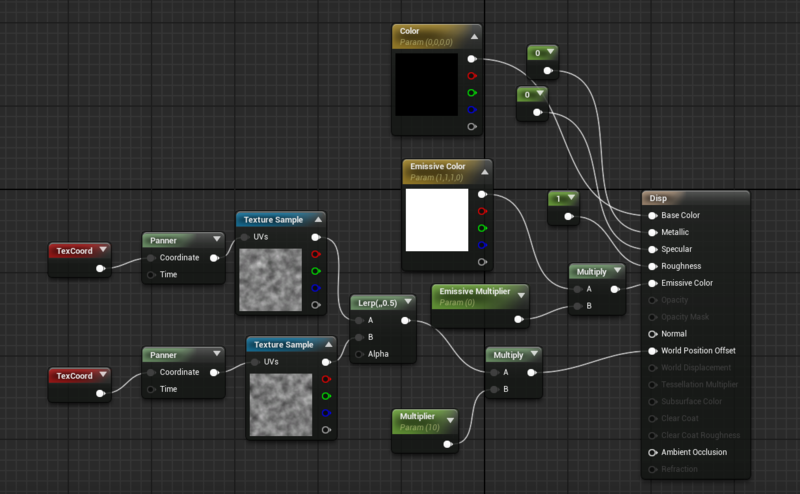 I have a material that is animating vertex displacement (not tessellated) using two panning noise maps lerped. I have to keep the camera moving in order to keep it rendering correctly, as soon as the camera stops moving it dissolves. I thought it might have been an issue with the lighting so I put it in an empty scene with no lights and made the material glow and it still resulted the same. Of course the material renders just fine when the displacement isn't involved. It looks to be a result of the Temporal AA, you should be able to check Responsive AA to true in the Material Attributes and get a much better viewport render of your wireframe. Hi Eric, the Responsive AA option is only available for Translucent materials though? For non trans materials what should I do?